Classic eyewear that transcends the holiday spirit. 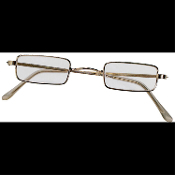 Rectangular lens and gold metal frames that rest comfortably on the end of the nose. An excellent selection for a diverse range of costumes, from Benjamin Franklin to Merlin the Wizard.